On herbivore dung. The small, flattened, button-like discs are white, grey or pale fawn. 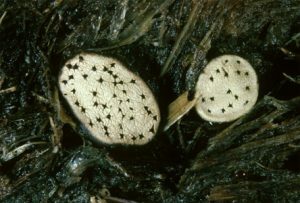 On the top are minute but distinctive dark holes (ostioles) through which spores are expelled. 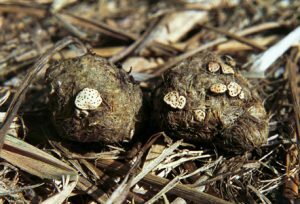 The dry, hard disc has a tapering base embedded in the dung.